Hideki Matsui was back in Japan for the first time since announcing his retirement in late December and back on the field where he hit home run after home run for the Yomiuri Giants in front of packed houses from 1993-2002. 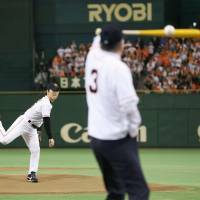 He stood alone just in front of the pitcher’s mound at Tokyo Dome, cast in the glow from a pair of spotlights in an otherwise darkened stadium, as more than 46,000 fans went silent. “Giants fans, it’s been a while,” Matsui began, “I am so happy to have the opportunity to return to Tokyo Dome and be with you today. Some of my best days in baseball were playing here before you with the Giants and for (Shigeo) Nagashima-kantoku. 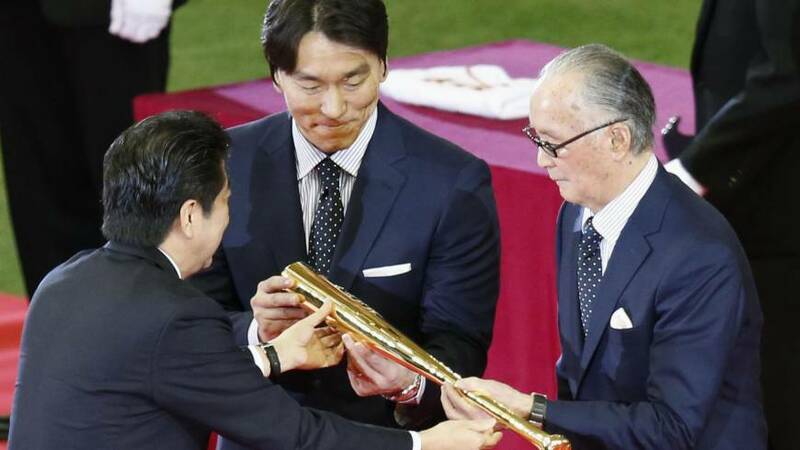 Yomiuri held a retirement ceremony for the former Giants and New York Yankees star before facing the Hiroshima Carp on Sunday, the same day Matsui joined Nagashima, his former manager and a Giants legend, in receiving the People’s Honor Award from Prime Minister Shinzo Abe. 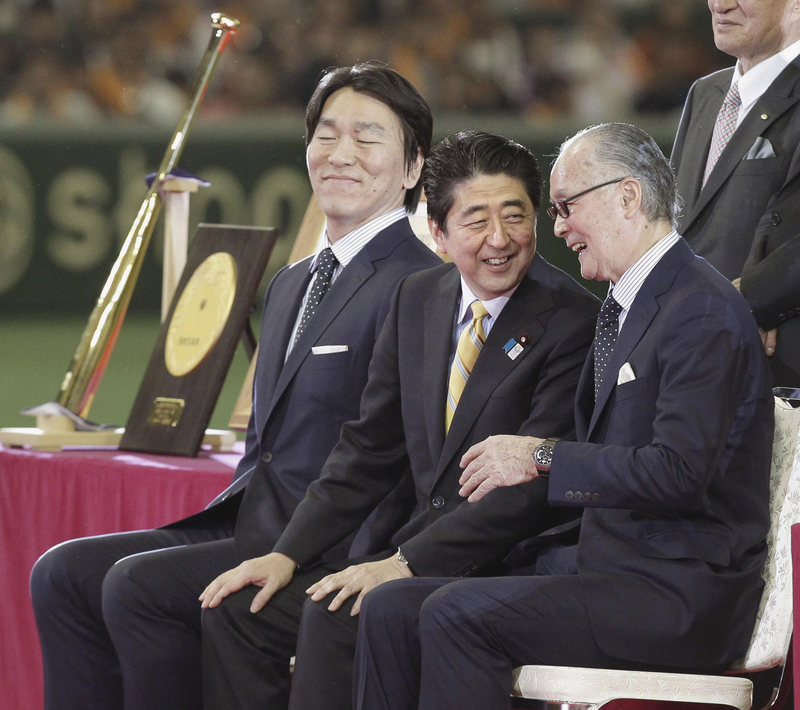 “It gives me great pleasure today to present this award to you both for your outstanding contributions to the game of baseball,” Abe said. 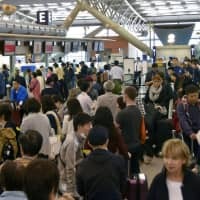 “Fans in both Japan and the U.S. enjoyed watching you, and the Japanese people are very proud of you. 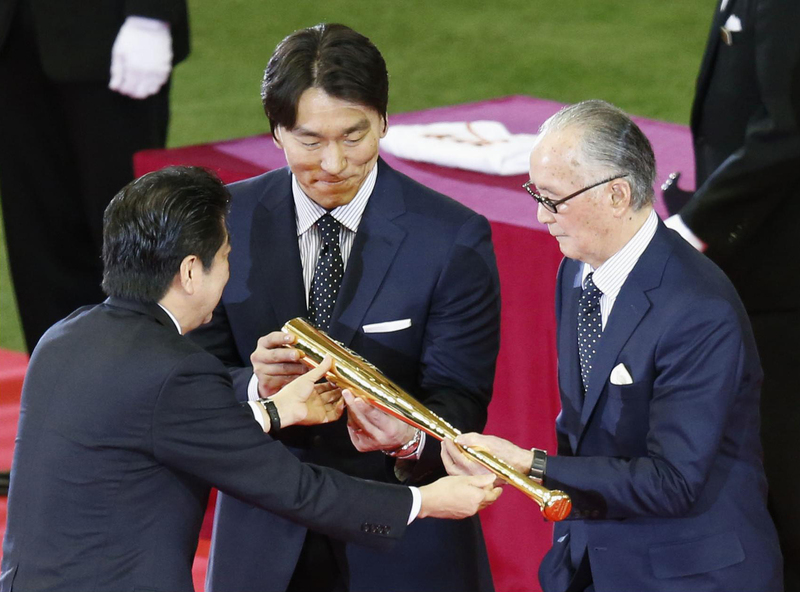 The pair were each presented with a gold bat from the prime minister and flowers from past award recipients, Giants legend Sadaharu Oh and Carp great Sachio Kinugasa. 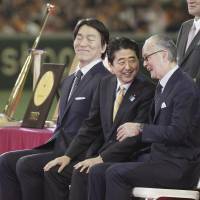 Matsui and Nagashima later presented Abe with a Giants jersey. 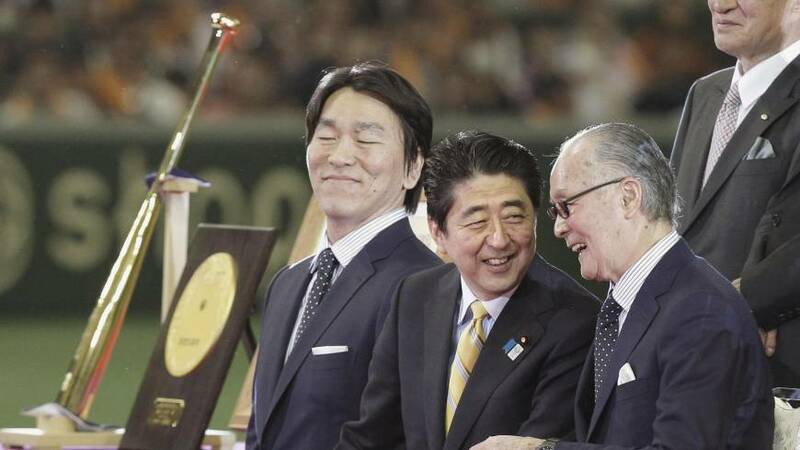 They left the field following the ceremony while a montage of footage from Nagashima’s days as Matsui’s manager played on the Tokyo Dome video board. The pair returned to perform the ceremonial first pitch to a raucous ovation a few minutes later. Nagashima stepped onto the field clad in his famed No. 3 home jersey, and Matsui was in a full Giants uniform for the first time since 2002. 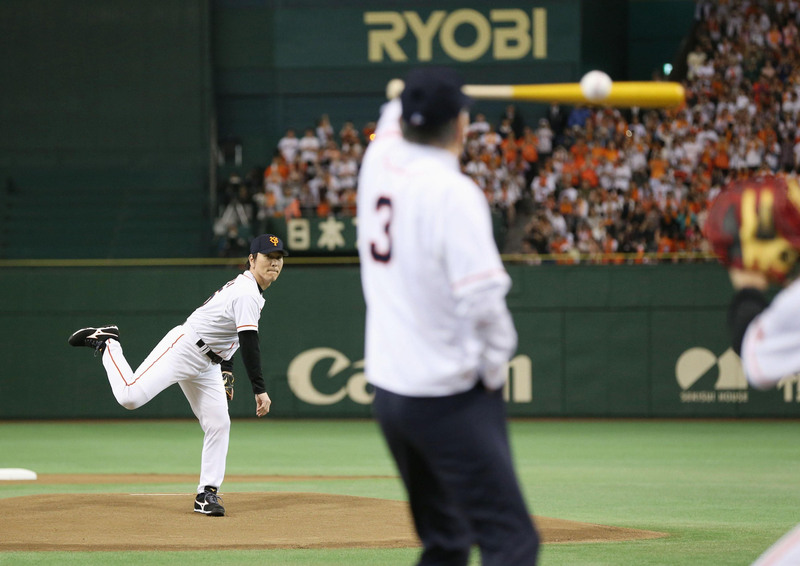 Matsui took the mound as the pitcher, with Nagashima in the batter’s box, current Giants manager Tatsunori Hara as the catcher, and Abe, wearing his No. 96 jersey, serving as honorary plate umpire. Matsui’s pitch was high, and Nagashima swung and missed, as is customary. The People’s Honor Award is given in recognition of a person’s career achievements and tremendous popularity among the public. Full of charisma and natural talent, Nagashima, known to many simply as “Mr. 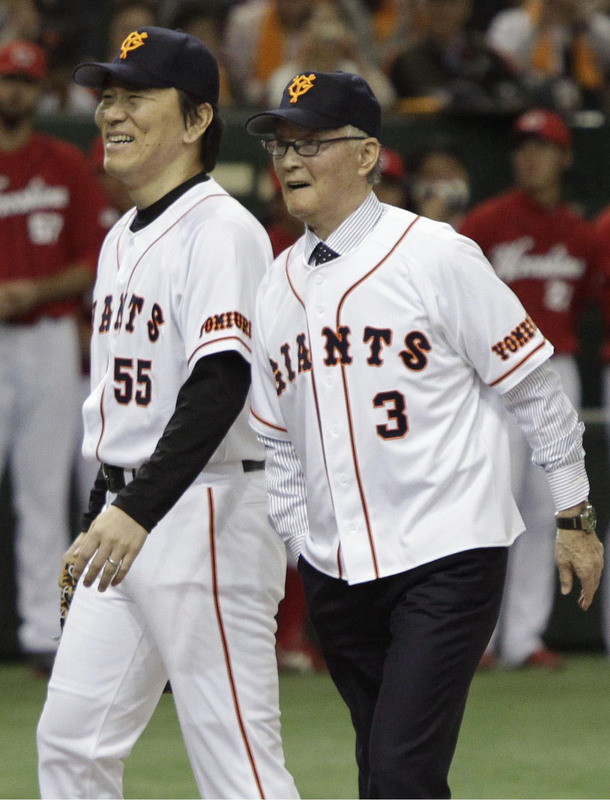 Pro Yakyu,” hit .305 with 444 home runs, and 1,522 RBIs over a 17-year career and was the face of the revered V9 Giants, who won nine consecutive Japan Series titles from 1965-1973. 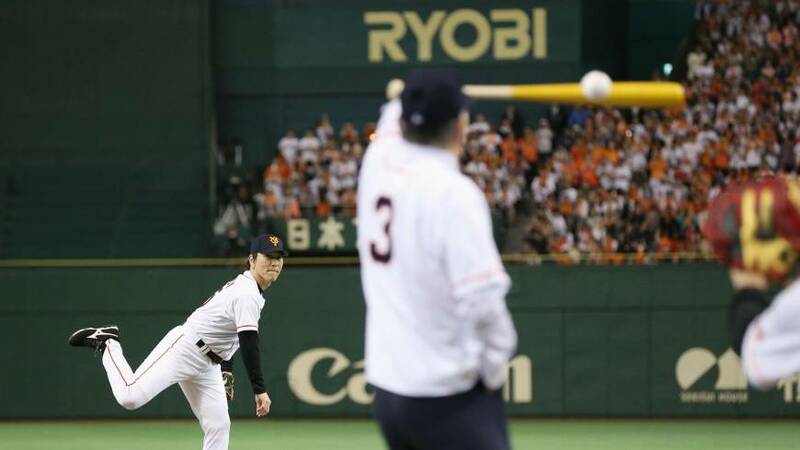 Nagashima won the Japanese Fall Classic on two other occasions with the Giants. 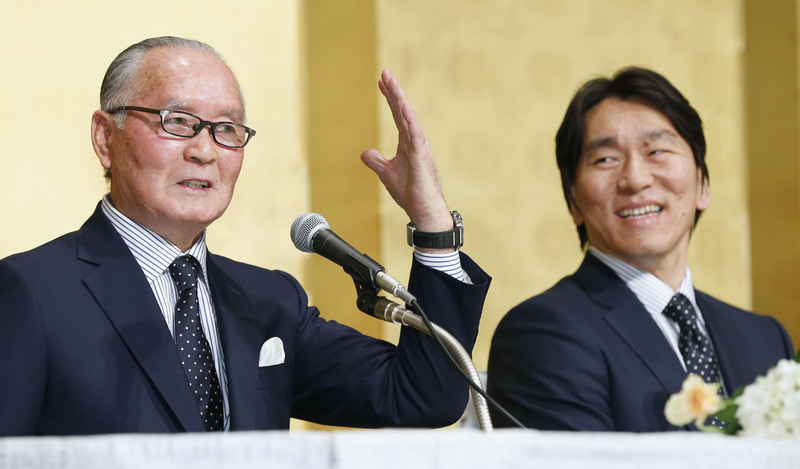 Nagashima was the 1958 Rookie of the Year, a five-time Central League MVP and four-time Japan Series MVP. 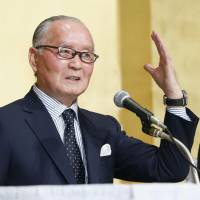 The most memorable moment of his career came on June 25, 1959, at Tokyo’s Korakuen Stadium, when he hit a sayonara home run off Osaka Tigers pitcher Minoru Murayama in the first game attended by the emperor. 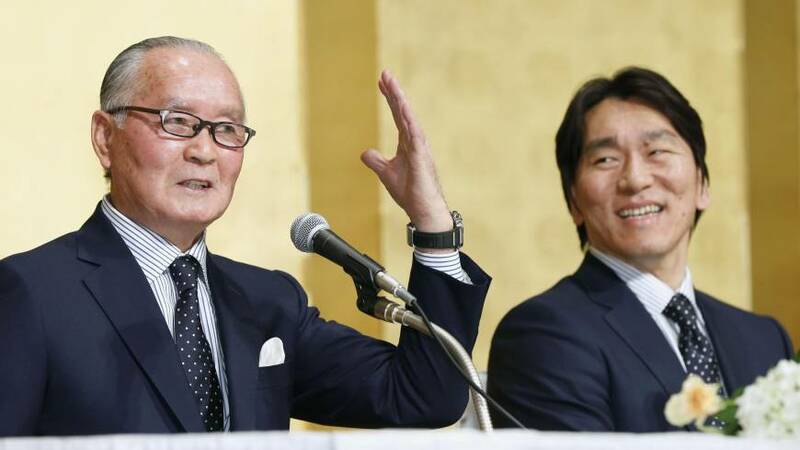 Nagashima led the Kyojin to two more titles as the team’s manager, the first coming in 1994, during the breakout season of a second-year outfielder named Hideki Matsui. 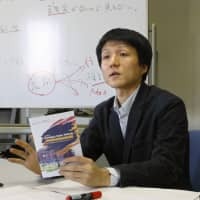 Matsui was a feared hitter during his time at Kanazawa, Ishikawa Prefecture’s Seiryo High School, and selected by the Giants in the first round of the 1992 draft. 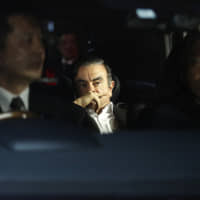 He hit .223 with 11 home runs and 27 RBIs for Nagashima in his rookie year, and would never finish another season in Japan with fewer than 20 home runs. After 10 years as the most popular player on Japan’s most popular team — Matsui hit .304 with 332 home runs and 889 RBIs for the Giants — “Godzilla” decided to take a bite out of the Big Apple and signed with the Yankees after the 2002 season. Matsui hit a grand slam in his first game at Yankee Stadium and became a favorite among fans and media alike while quickly dispelling the myth that a Japanese power hitter couldn’t make it in the majors. Matsui’s crowning MLB achievement came in his final game for the Yankees, when he went 3-for-4 with a home run and six RBIs during the clinching sixth game of the 2009 World Series. He was named MVP of the 2009 Fall Classic, a first for a Japanese player. “He was a great player,” said current Giants infielder Jose Lopez. Matsui hit .292 with 140 home runs and 597 RBIs in seven seasons in New York. He spent his final three MLB seasons with the Los Angeles Angels, Oakland Athletics and Tampa Bay Rays, retiring with a .282 average, 175 homers and 760 RBIs during his MLB career. 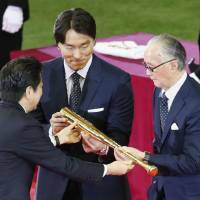 “I had the chance to play in America for 10 years and I have no regrets about my playing career,” Matsui said during his remarks.